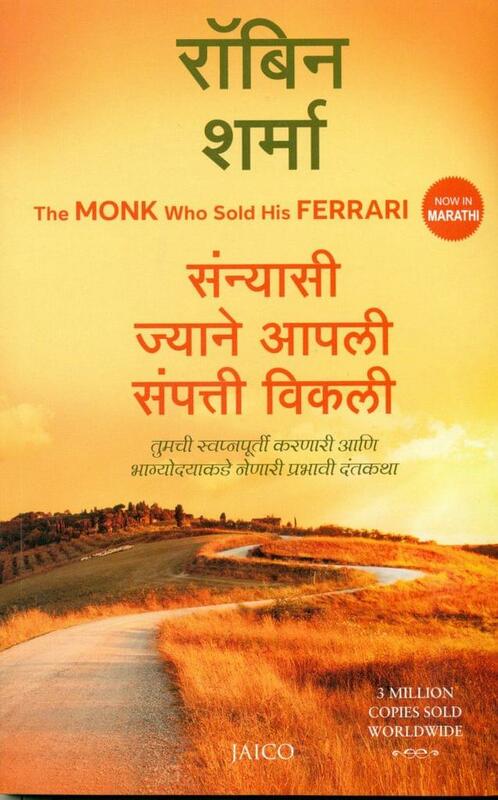 Now In Marathi, Sanyasi Jyane Apli Sampati Vikli, wisdom to create a Life of Passion, Purpose, and Peace. This inspiring tale provides a step by step approach to living with greater courage, balance, abundance and joy. A wonderfully crafted fable, The Monk Who sold His Ferrari tells the extraordinary story of Julian Mantle, a lawyer forced to confront the spiritual crisis of his out of balance life. On a life changing odyssey to an ancient culture, he discovers powerful, wise and practical lessons that teach us to, develop joyful thoughts, follow our life's mission and calling, cultivate self-discipline and act courageously, value time as our most important commodity, nourish our relationships and live fully, one day at a time. A fable about fulfilling your dreams and reaching your destiny.